Operations of all sizes can benefit from refining their processes using Continuous Improvement (CI). Our belief is that you can integrate continuous improvement techniques simply, by systematically applying common sense. People who want a simple, practical and low investment guide to get started with continuous improvement techniques. People who want an in-depth guide to Kaizen, Lean or Six Sigma. Continuous Improvement is a long-term approach towards improving processes, products and services. Organisations that practice Continuous Improvement make small, incremental changes to existing, standardised work processes. Over time these improvements accumulate to significant gains in overall efficiency, giving your business an increasingly competitive edge. Fundamental to the practice of Continuous Improvement is the habit of standardised work. When everyone follows a well-practised, consistent set of steps that are based on best practice, it reduces fluctuation in process quality. It makes it easier to spot inefficiency and opportunities for improvement. When issues do occur, it can help you put aside time to really understand the root causes and put in place long term fixes. Over time, this habit can iteratively increase the predictability of work and reduce variation in the quality of your service. The goal of Continuous Improvement is to enable teams to iteratively find ways to deliver more value to their customers, faster and more economically. It does this by through a feedback loop of planning, executing and reviewing changes. If improving and innovating is a priority, some time has to be made for these activities. Keeping improvement tasks small and achievable helps teams perform their daily work, alongside a limited number of change activities. When time is invested into streamlining, and improving the way work is done, you can increase your capacity and do even more. Starting small is a considered approach if you’re new to continuous improvement. Early education plays a critical part in helping your team understand what CI is, and how to integrate it into their habitual work. Smaller-scale pilot initiatives, where overall risk is low, is more likely to be successful and buy in the confidence of your team for the future. Try to choose something small, where you feel you may find some quick and easy wins. Once you understand who the key players are in a process it’s time to bring them together to map it. Every team has a process for getting things done, whether it’s formally written down or not. You’re aiming to get the process down on paper as it is now, not how you or anyone else thinks it could be done better. Continuous Improvement is based on the idea that if you don’t know where you are, you can’t get where you are going. You Will Need. Your team, in a room, with a pack of post it notes, whiteboard or spare wall, board markers. Time. You should be able to achieve this in an hour, although it’s important not to cut your team short. You’re likely to work through group politics, some high value discussions will take place so you’ll need to give your team the time to work through this. Start sticking the Post-it notes on the wall or whiteboard in the order that the work is done, if they are the same just stick the Post-it notes on top of each other. Don’t worry too much about doing this the “right way.” The right way is the way that helps you and others involved understand the process. A great place to start is simply just using the Post-it notes, a white board or spare wall and, but you might want to add copies of forms and photos if they help. Once done, work through the process and let the discussion evolve. Add more Post-it notes and fill out the process the team agrees that it is totally mapped out. Remember you are trying to map out how things are done now not how they should be. As you start brainstorm ideas your team will naturally start to share the daily issues they face with their work. You’re likely to come across few ideas of how the process could be improved, or what frustrates them. Start to capture them on separate post it notes and start a Brain-dump board of ideas that could be done to improve a process. Where do you get the detailed information about what your doing? What problems do you have here? (i.e. time wasted, spending too much money etc. How would you like that process to work? What would happen if that spreadsheet was corrupted? Are there any easy, top level metrics that you can use to measure this process? Examples might be: Number of customer complaints per month, visits to your website, total time taken for the task (you might want to put a nominal estimation on each part of the process). Try and come up with one valuable metric which is an indicator of how successful the process is. If you don’t have process documentation already, this is a great time to document the standardised process electronically. It is dangerous for a business to rely on expertise that is only in your team's heads. Software is useful for drawing this neat final diagram but the Post-it method given here works better for the messy initial stages of creating the process flow. Start to group ideas that sit naturally together or would need to be done together to be effective. You might want a specific theme for quick wins,things that you can do straight away which are quick, easy and need minimum investment. Grouping brainstorming ideas into themes helps identify quick wins, things that can be done straight away. As a means of drawing the meeting to a close, ask the team to put the themes into a priority order so that they flow logically in terms of implementation. Software is useful for keeping a record of all of the ideas your team have - something like Trello might work well or a spreadsheet. The method given here works better for the messy initial stages of creating the brain-dump - so don’t be tempted to skip straight to software. Time to get going on your plans. 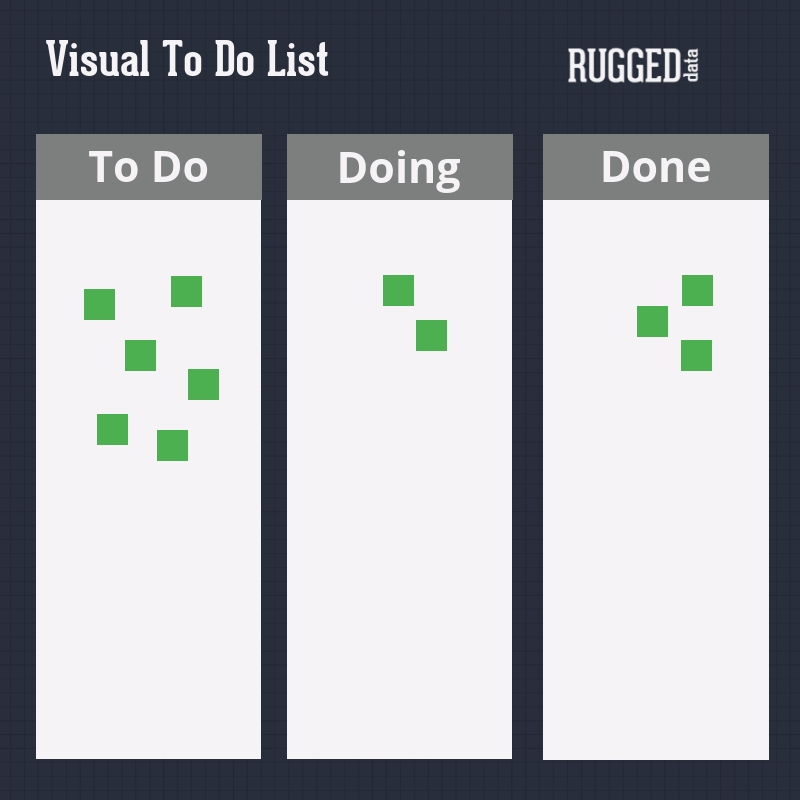 Now you have a ‘backlog’ of ideas that are grouped into themes in order of priority. Again this is less about finding the perfect process and more about getting started. Over the next few weeks/months your new visual process will take more form, and solidify into a habit that is easy for your team to maintain. To get started we’re going to limit work in progress. This may seem counter-intuitive, but limiting what’s on your ‘to do’ list can help you finish more work, more quickly by allowing you to focus on a single task rather than being distracted by many. Ask your team if they could commit to achieving just one improvement task this week that is considered a priority. Get them to write it on a Post-it and stick it under 'To do'. When a task is started move it to 'Doing' and put a name on it. When it’s complete move it to 'Done'. Once the end of a cycle arrives, take a fresh look back over your progress from the last week, and see what you can gain from it. You will need. Your team around the 'To do' list on the wall. Gather around the board and review the progress this week. What has worked, what hasn’t worked, are things improving? Jump back to the Planning step, review the documented Standard Work - what’s changed? Quickly review process documentation and make it is up to date with the current state. Review the metric you chose to monitor the success of the progress - what is it now? Is there any ideas that can be added to the ideas backlog, does it need to be re-prioritised? Schedule the next kick off meeting for the next cycle. There is no end to the process of reducing effort, time, space, cost, and mistakes. Return to the first step and begin the next lean transformation, offering a product which is ever more nearly what the customer wants. By staying disciplined and continuing to follow this strategy, gradually, week-by-week, you'll be able to watch your team tick off and achieve small improvement tasks. As the 'tick off' accumulates you’ll notice that the habit of repeatedly achieving small things can add up to significant change. Maybe the time and resource that you have saved from gradual improvements can justify more significant investment - maybe new software or machinery. You might even find some business processes that can be dropped entirely - leading to significant savings. You might want to map-out processes in more detail. 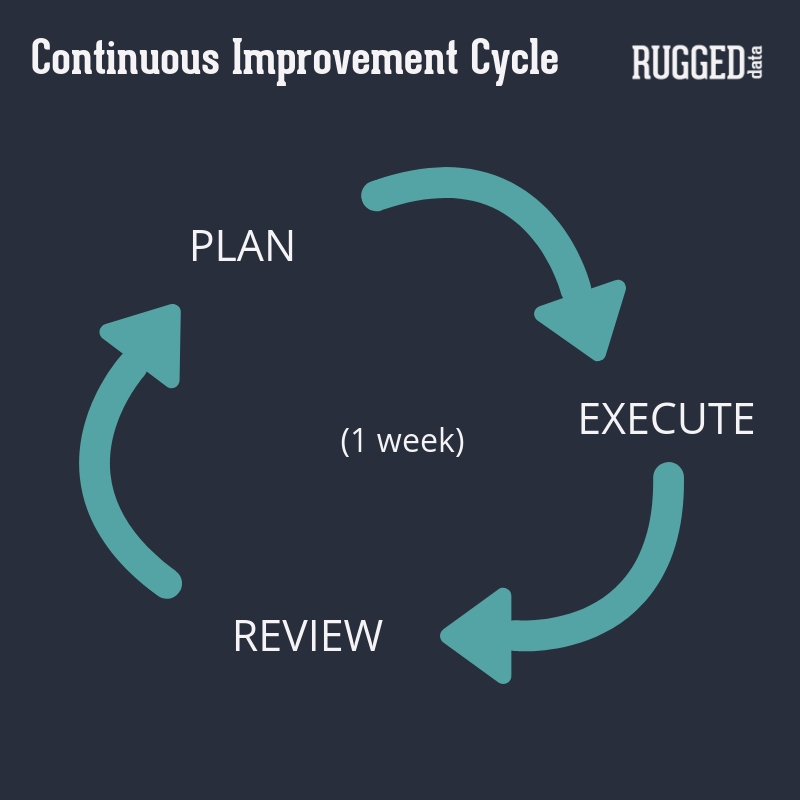 Perhaps you might want to review another process and add it into the cycle, use it as a flexible system and mould the basic tools around to work for your team. Maybe you need a different board for each of your teams. Start small - get some quick wins with little investment - expand the process carefully.